The ’40s bungalow just “felt right” as soon as Shannon and Pablo Supkay walked through the front door of the 2,000-square-foot house 10 years ago in Seattle’s Lakewood neighborhood.The two-bedroom house had a cozy atmosphere, the neighborhood was familiar to the couple, and they were instantly charmed by the peaceful Lake Washington view. Before shot of the home. 10 years ago in Seattle’s Lakewood neighborhood. PHOTO: Benjamin Woolsey. The name of this Lakewood house, called Mangosteen, was inspired by the homeowners’ travels and life in Southeast Asia where they fell in love with the fruit, mangosteen. The fruit's tough, textural peel is mirrored in the exterior red cedar siding, and its smooth, white center, is similarly reflected in the interior layout. “Then…we had the children [now ages 7 and 4] and we needed more space,” Shannon says. “We realized we couldn’t even have people over for dinner. We contemplated moving, but we didn’t want to leave this spot.” Instead, the couple decided to explore the idea of adding a floor and expanding the deck. “That’s all we wanted to do,” Pablo notes. PHOTO: Benjamin Woolsey. Windows covering the rear facade stream natural daylight into the kitchen and dining room. PHOTO: Benjamin Woolsey. Views of Lake Washington can be seen from the deck off the master bedroom. PHOTO: Benjamin Woolsey. The children’s rooms have a sliding door (recessed in photo) connecting the spaces between them. PHOTO: Benjamin Woolsey. Milestone floors line the master bathroom which also features a skylight in the shower. The original design plan was to keep the existing footprint, expand the firstfloor deck and add the 1,000-square-foot second story, which would house three new bedrooms—a master suite and two bedrooms and a bath for their daughters— along the east side of the house facing the lake. However, it became clear the existing stairs were in an awkward place and hindering the first-floor layout. So, the once small, dark two-bedroom cottage was taken down to its foundation and rebuilt, with the living room, dining room and kitchen located in the same place on the first floor, and the staircase moved to the street side of the house. What emerged from the ground up was a modern design with a window-covered rear facade that captures the morning sun and lake views from all three floors. 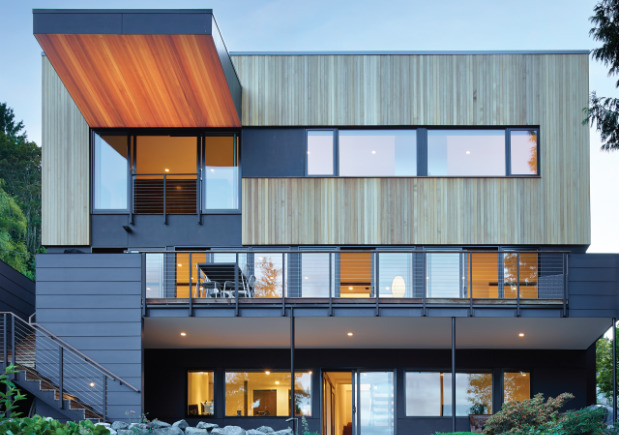 Dramatic western red cedar siding on the street side of the property offers privacy. Even though the new, 3,000-squarefoot home no longer looks like a cottage, its modern design still manages to preserve the original sense of coziness the couple experienced on that first day they walked through the old bungalow’s door. This modern home was selected by a panel of architects for the AIA Seattle (aiaseattle.org) Home of Distinction program to celebrate its compact and thoughtful layout supporting the owners’ indoor/outdoor lifestyle, together with great use of cost-effective and quality materials where they have the most impact.